Although it marks the entry point into the Line 400, the compact dimensions of the BS 403 belie its exceptional performance capabilities. In small to medium-sized rooms, this 2-way, bass-reflex design delivers extraordinary sound that will leave even the most critical listeners enthralled. The 400 line is a striking illustration of how design and function can be seamlessly combined. Decorative aluminium elements transform the technical components of the loudspeakers into visual highlights and the crossbar support system fitted to the floor-standing models provides an elegant—and extremely stable—foundation. The most striking acoustic innovation is the JET 5 tweeter. Outwardly recognizable by its modified appearance, it converts electrical signals with even greater precision—virtually free of inertia. By combining it with a new simplified crossover, ELAC engineers have managed to further improve the high-frequency resolution of its predecessor. The use of newly developed loudspeaker chassis enables performance in the low and mid-frequency range to match that of the JET 5 tweeter. Ensuring excellent signal fidelity at all volume settings and an even deeper bass response were at the very top of our list of priorities. The Line 400 speakers leave no doubt that a new sonic benchmark has been set for loudspeakers in their class. The eye-catching surface of the crystal membrane is more than just an attractive design feature. Woofers and midrange drivers in the Line 400 employ the Crystal Membrane (patent pending) and their design is based on ELAC’s Aluminium-Sandwich AS Technology. The crystal-shaped inverse aluminium dome is joined to the paper cone in a special gluing process to result in the desired sandwich construction. Resembling the surface of a large crystal, the aluminium-foil stamping stiffens the aluminium dome, diminishing resonances and minimizing coloration, while improving power handling and dynamics. The voice coil design of the midrange and bass drivers results in an expanded range of the respective drivers by nearly an octave. 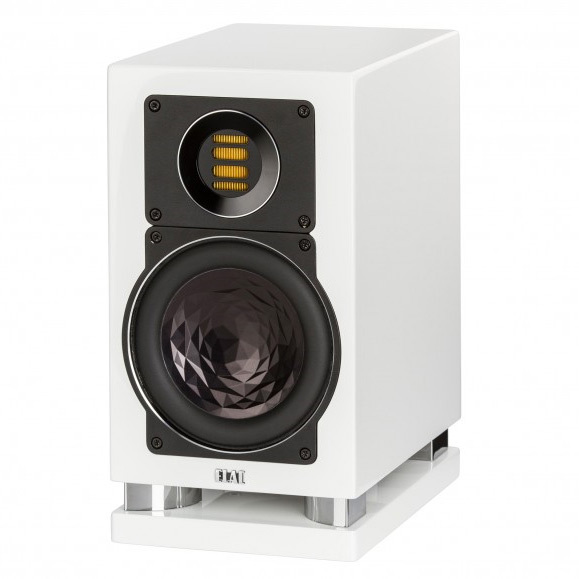 Delivering true high-definition sound, ELAC’s JET 5 tweeter enthrals with its lightning-fast response and wide dynamic range, offering minimal distortion, lots of headroom and a distinctly wider frequency range than conventional dome tweeters. 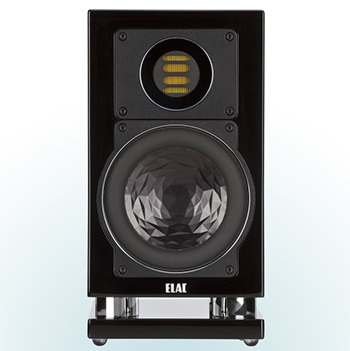 The ELAC JET tweeter is one of the most legendary tweeters in the industry and has won international praise with its transparent and effortless sound image.